After 18 chapters worth of Job’s ranting, debating, defending, whining; after 6 chapters of Elihu’s intervention; after 4 chapters of the Lord speaking, we finally hear Job again. And this time, it’s a different Job speaking. A different understanding, a different attitude – hence, a different Job. In essence, Job has been humbled – if not at all by Elihu’s haughty but substantial lecture, then surely, wholly by the majesty of the Lord’s speech. The book of Job could have ended after the Lord spoke – God had made his point, which was for Job not to look at his suffering but to look at the majesty of the Lord instead. The Theology of Suffering has ended after the Lord stopped speaking, at the end of chapter 41. But thank God we were given chapter 42. Here we see Job’s change and his resolution with himself and with his friends, and finally, with God. Here we see the doubled blessings given to him by God after he overcome his limits and broke new ground in his spiritual understanding. Here we see that there is hope, even in suffering. In this study, the focus will be very much on the epiphany that Job received in his 10 chapters of silence, in his 10 chapters of listening, and like Job, despite our sufferings, let us meditate and look upon the sovereignty of the Lord. Agreement with the Lord’s speech in Job 38-41: Unlike his previous 3 friends, he had absolutely nothing to argue this time. Acknowledgement of his knowledge of the contents of the Lord’s speech in Job 38-41: That God is sovereign, and man is limited. Acknowledgement of his understanding of the reason why the Lord said what he said in Job 38-41: That he should focus on the Lord. you can do all things – God can do all things – we often say this, and we often ‘know’ this, but rarely do we really take in the entirety of the connotations of this statement. We often limit ourselves into boxes – we often limit God into a box, and we have a tendency to think that some things are beyond God. God won’t be able to help me in this. God won’t be able to help me in that. There’s no point if I pray now, since it already happened. Omnipotence becomes merely symbolic to us. Often we need to sit through a lecture by God, as Job did as well in the previous chapters, to be reminded of how amazing God is, and how ignorant we are in comparison. Nothing is too hard for the Lord [Gen 18:14]. What Job couldn’t do, the Lord can. What we cannot do, God can. All the peoples of the earth are regarded as nothing. He does as he pleases with the powers of heaven and the peoples of the earth. No one can hold back his hand or say to him: “What have you done?” [Daniel 4:35]. This is when theoretical knowledge transforms into practical knowledge for Job. He submits to the will of God, and acknowledges that it is sovereign, because with God all things are possible [Matthew 19:26]. 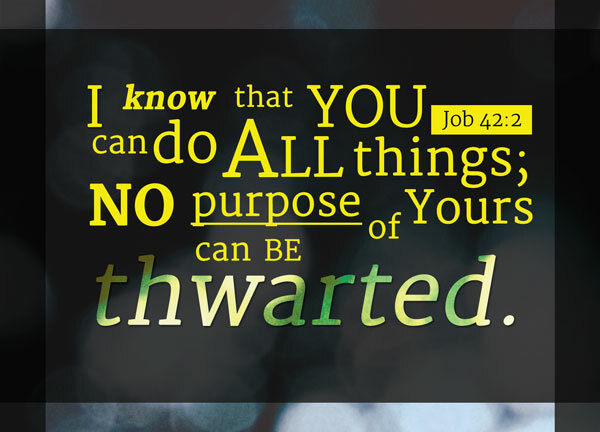 no purpose of yours can be thwarted – thwarted is a word often associated with the devil – he thwarts plans. He stumbles us. He forms obstacles in our paths to goodness. But God is greater. His plans and purposes cannot be thwarted. Try as the devil might, but as long as we draw strength from the Lord, his thwarting will only end up aiding us to the purpose of God. The Lord is sovereign, and his sovereignty can be seen even in our tragic moments. In some other versions this is rendered as no thought can be withheld from you (NKJV) – which hints at the omniscience of the Lord. But the plans of the LORD stand firm forever, the purposes of his heart through all generations [Psa 33:11]. There are many kinds of states to our knowledge. New knowledge, with which we are often awed and passionate about; old knowledge, with which we are often so used to it that we have long disbelieved it; forgotten knowledge, with which we have kept locked up somewhere so deep in our minds that we act as if we never had that knowledge at all. Why is it that we need reminding? [2 Pet 1:12|Article]. Why is it that as Christians, we should spend some time daily meditating the word of God, and return to Church weekly? Is it even possible for us to forget what the sovereignty of God means? I’m sure we often ‘forget’. The knowledge buries itself in our minds after sometime, and reverts from being practical back to theoretical. Our pride and frustrations blinds us from knowing God truly for who he is – the sovereign Lord, who does what pleases him. Let us be reminded that God is omnipotent and omniscient. Even in times of tragedy and grief, in times of difficulty and troubles, let us draw strength on God and have hope. When things don’t go the way we want them to, let us be humbled and focus on God instead. After all, even if we don’t survive through our troubles, there’s still an eternity in his courts to look forward to.